I am so thrilled that you have found my site, and I hope you find drawing and painting as gratifying and rewarding as I do. 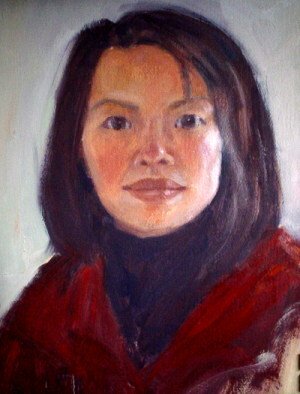 Hi, my name is Connie Nelson, and I am behind this site 'Explore-drawing-and-painting.com'. I have always liked to draw and paint. In elementary school I was known as the “school artist”. Drawing and painting was a blissful and 'easy' activity for me. I was also inspired by my father, who was a sumi painter. Still, I did not see myself an artist until after taking a job as a registered nurse. The toll exacted by the job on my body and soul made me question my purpose in life. One fateful day, while I was still working as a nurse, I stepped into an art teacher's studio and took my very first formal art lesson, and I have never looked back. I soon quit my nursing job after suffering from back pain lifting patients, and began seriously pursuing painting through continuing art lessons, supplemented by various workshops. Connie Lynn Reiley helped me perfect my drawing skills. Daniel Greene taught me how to draw human faces. Dawn Whitelaw, Tom Jensen, and many others have each added something special to my artistic vision and helped me take my art to still higher levels. One year, when my children were still fairly young, I went to Florence, Italy, to study oil painting at the Florence Academy of Fine Arts. This experience further deepened the belief that being an artist was my destiny! I started to show my paintings in both solo and group shows. My reputation as a pastel portrait artist also started to spread. At the same time I began to teach art to individuals and groups in schools and community centers, as well as in my own studio. I enjoyed this experience immensely, because it is exciting and validating to witness my students learn and grow. Being able to draw and paint, I am able to express myself more freely than ever. Now, through the online community, I desire to help others experience the same freedom. I personally think it is important to strive for an authentic growth in my art. Therefore, I am constantly sharpening my drawing and painting skills, and learning everything that interests me and will enrich my art. I live in the beautiful Pacific Northwest of the United States, surrounded by water and mountains. It's an enchanting place to live out an artistic life. The world is more colorful and interesting since I became an artist; every morning I wake up and wonder what to explore next. It is a wonderful way of life. What a blessing! If you have any question or comment about my site and art, contact me. I would love to hear from you!